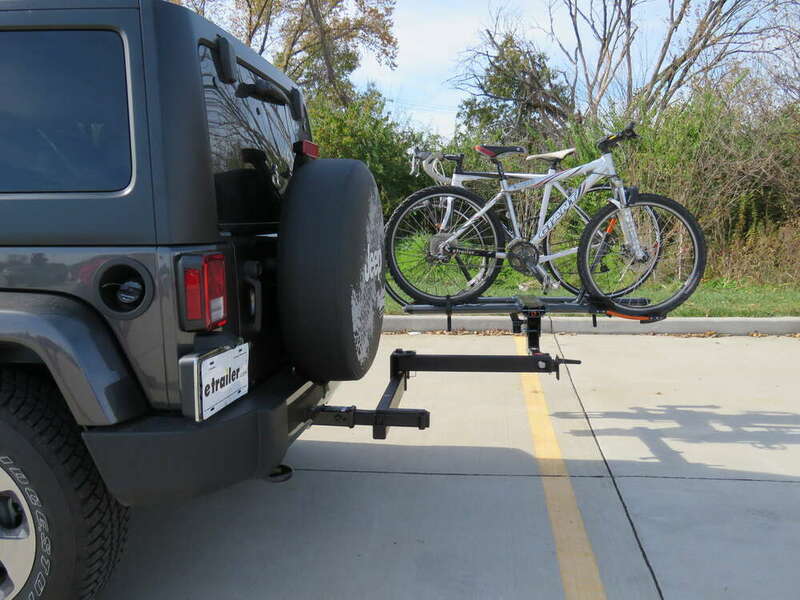 This hitch extender converts your existing Kuat bike rack into a swing-away rack. 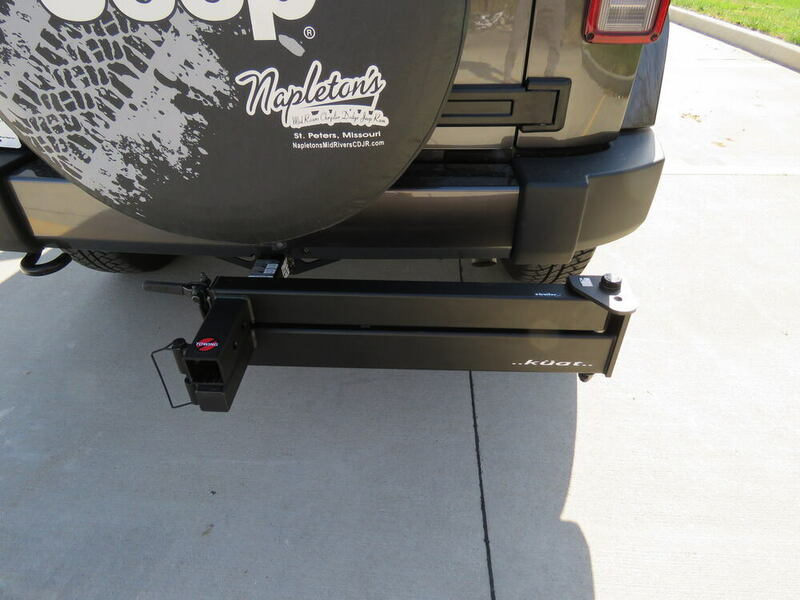 It rotates out 90 degrees to provide quick and easy access to the rear of your vehicle. 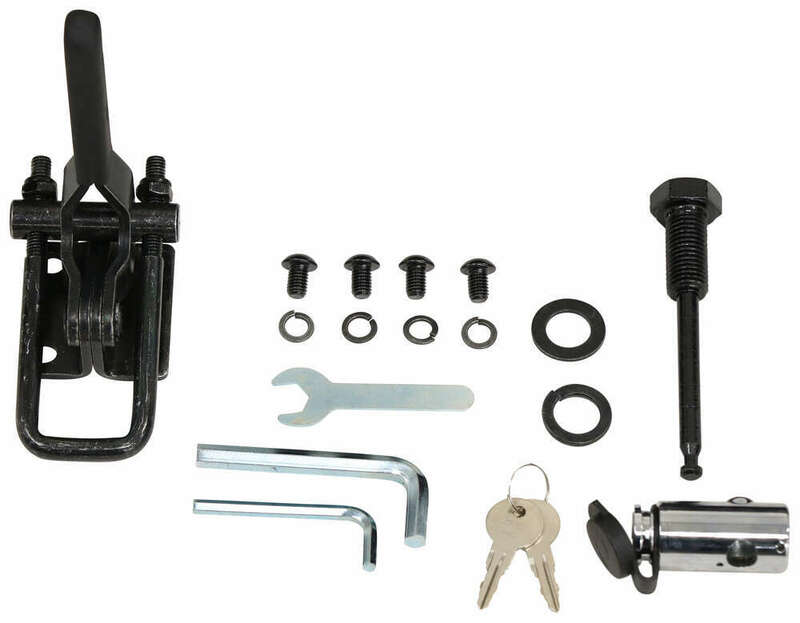 Includes locking, anti-rattle hitch pin. 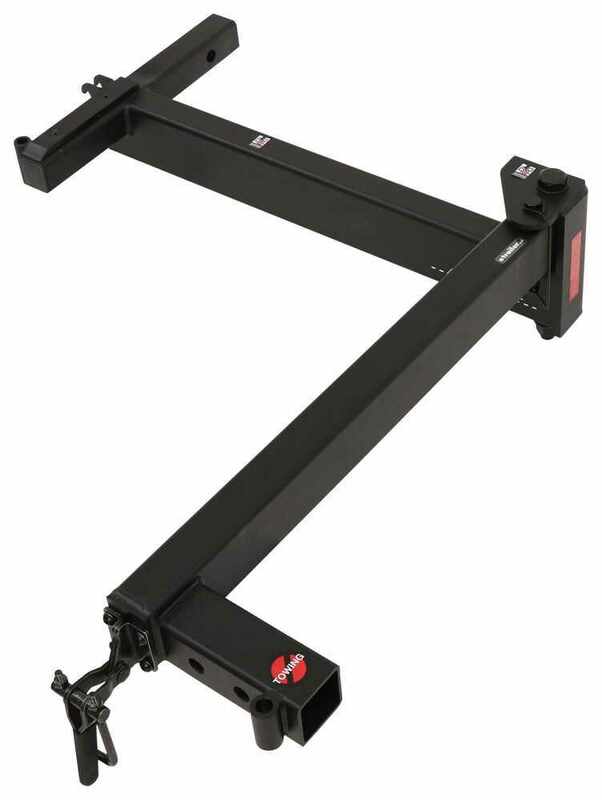 Call 800-298-8924 to order Kuat accessories and parts part number PV20B or order online at etrailer.com. Free expert support on all Kuat products. 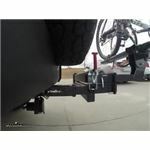 Guaranteed Lowest Price and Fastest Shipping for Kuat Pivot Swing Away Hitch Extender for Bike Racks - 2" Hitches. Accessories and Parts reviews from real customers. Center of closest rack pin hole: 8-7/8"
Center of farthest rack pin hole: 11"
Closest edge of carrier when folded: 5-1/4"
Farthest edge of carrier when folded: 13-3/4"
Farthest edge of carrier when unfolded: 36-7/8"
The Pivot converts your Kuat bike rack into a swing-away rack, giving you complete access to your hatch or tailgate area. 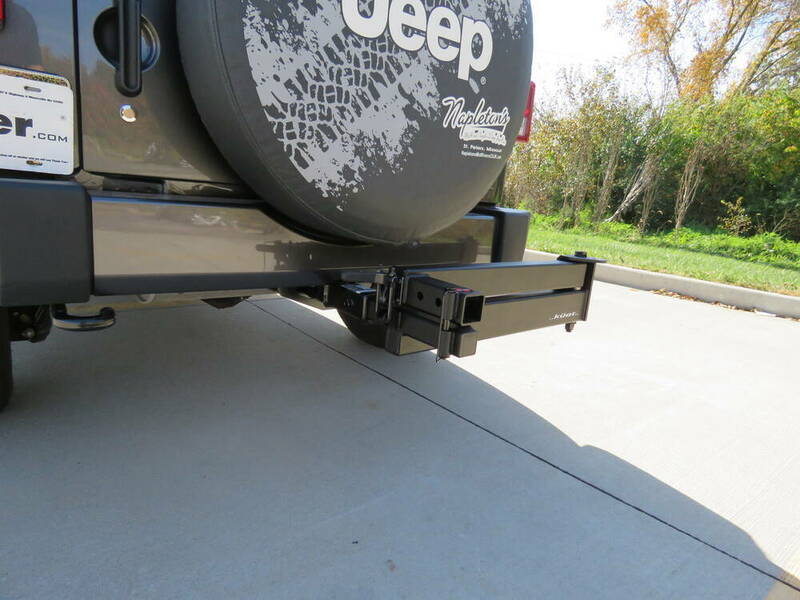 This makes it great for tailgating, quickly loading and unloading cargo, or letting your dog in and out of the back. 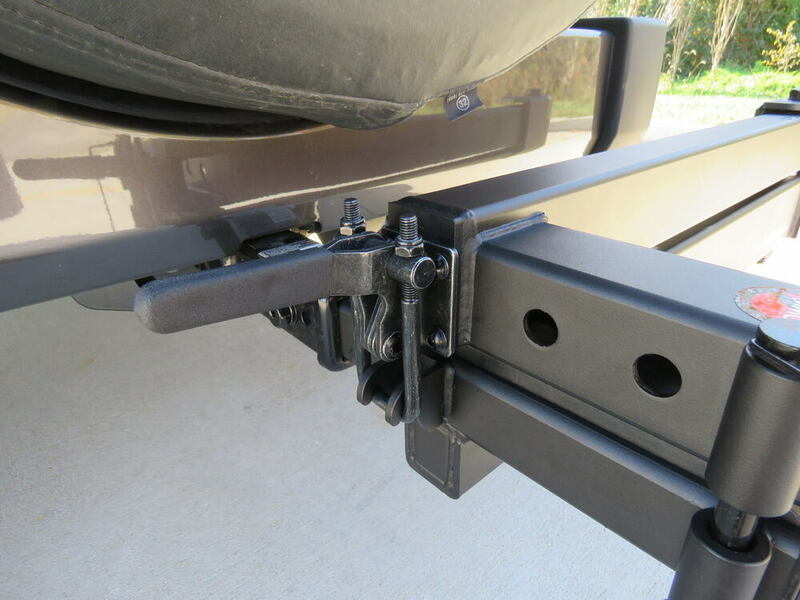 The Pivot installs in your 2" hitch with the included anti-rattle hitch pin. 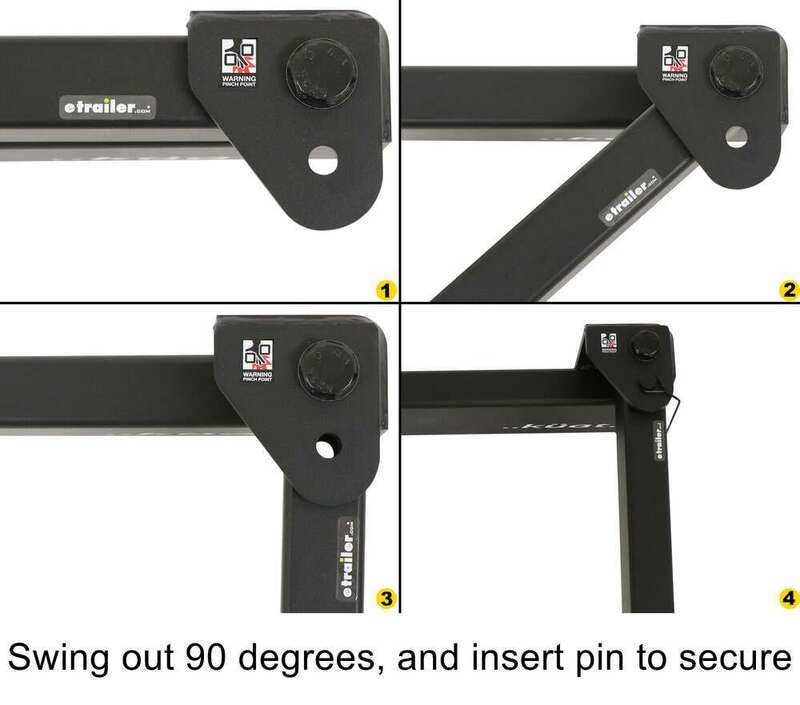 It also includes a 90-degree, barrel-style lock that deters theft of the extender. 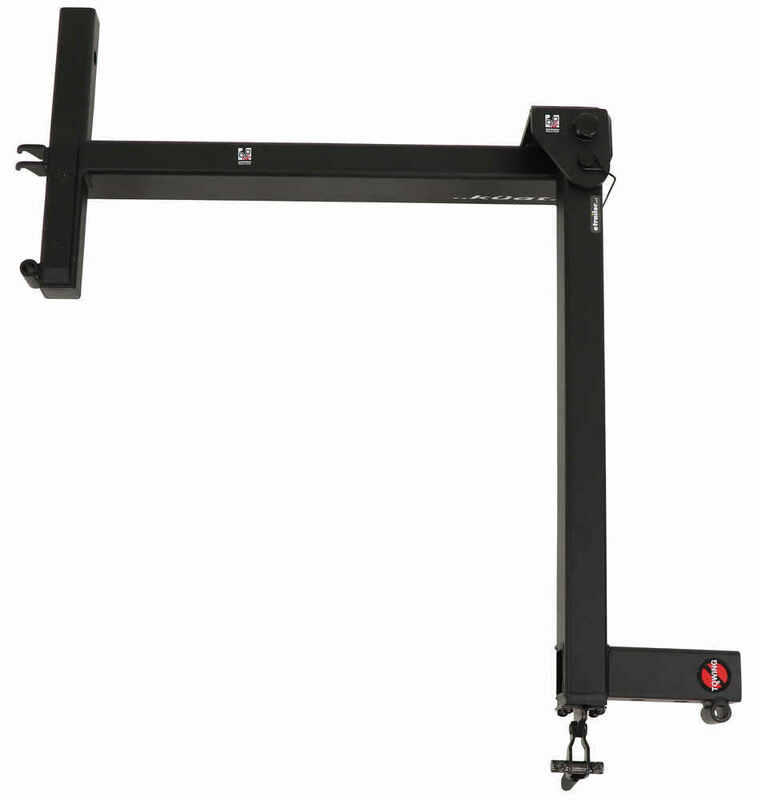 The Pivot features a hinged arm that lets you swing the rack 90 degrees away from the rear of your vehicle. 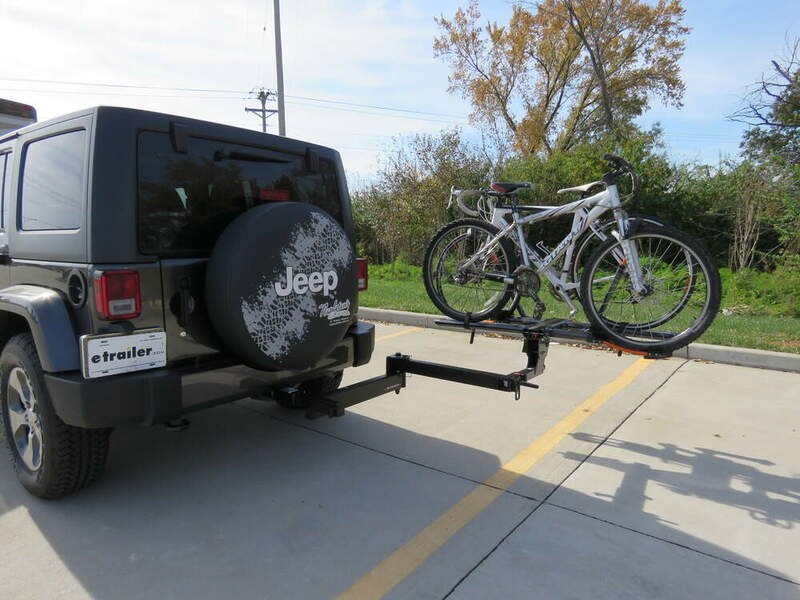 This gives you full access to your vehicle's rear cargo area, and it eliminates the need to remove your bikes or the rack. 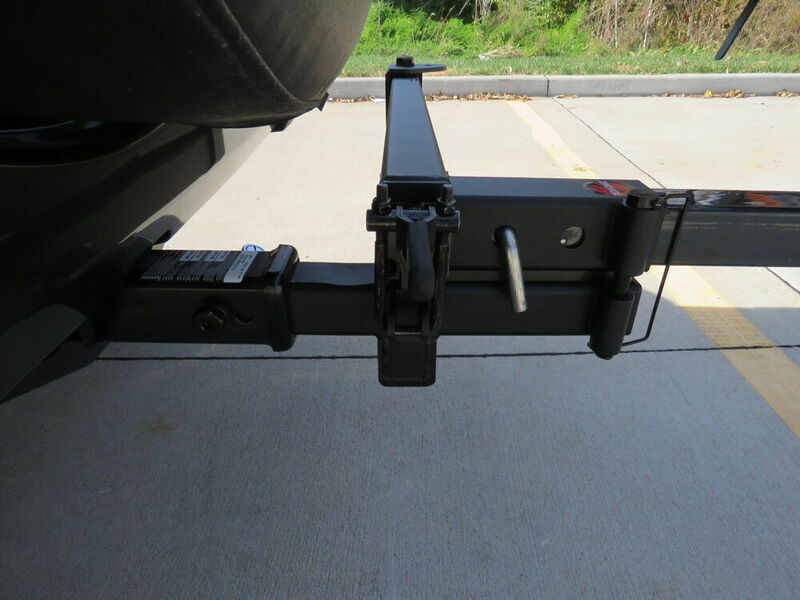 The Pivot also works as a hitch extender, so it's perfect for use on vehicles with a rear-mounted spare tire. 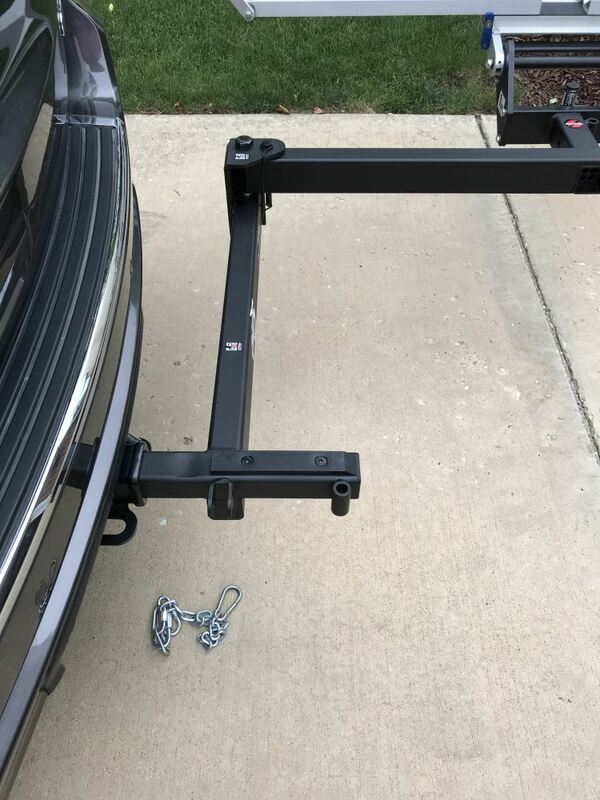 To open the hinged arm, simply lower the toggle clamp to release the safety gate latch, remove the safety pin, and swing the rack away from the rear of your vehicle. You can secure the arm with the safety pin once it's fully extended at 90 degrees, leaving your hands free to open your hatch and remove cargo. To close the Pivot, just remove the pin at the end of the adapter, and swing the extended arm back into position. 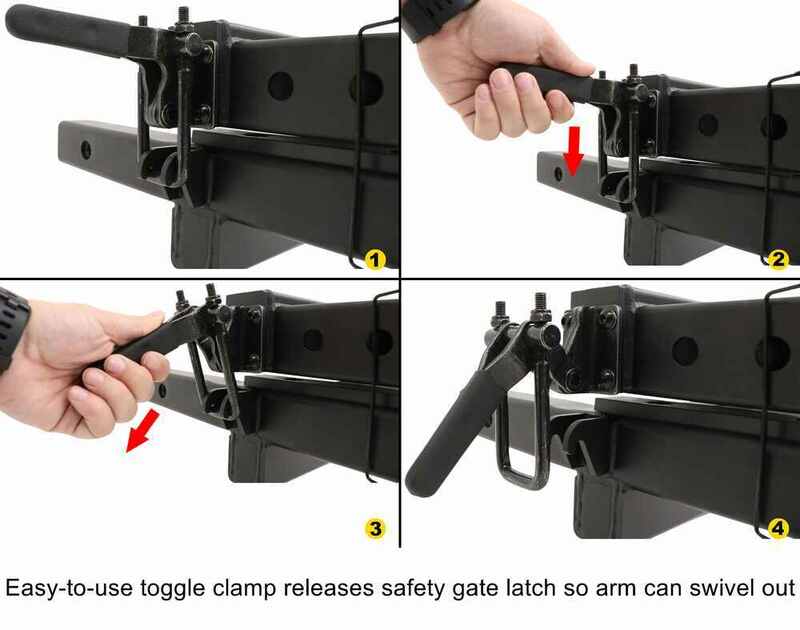 Once the arm swings back into place, put the safety gate latch back into position, raise the toggle clamp to secure the arm in place, and re-insert the safety pin. 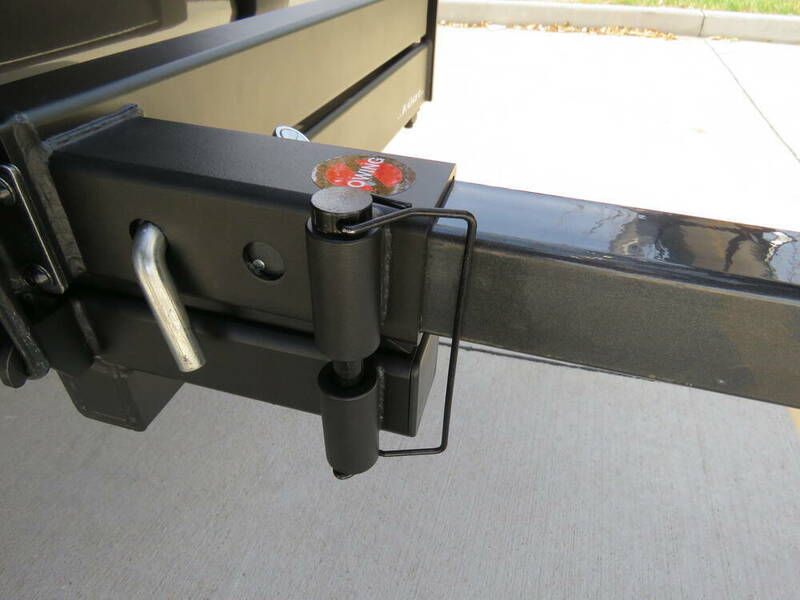 The Pivot installs quickly and easily with a threaded, anti-rattle hitch pin. 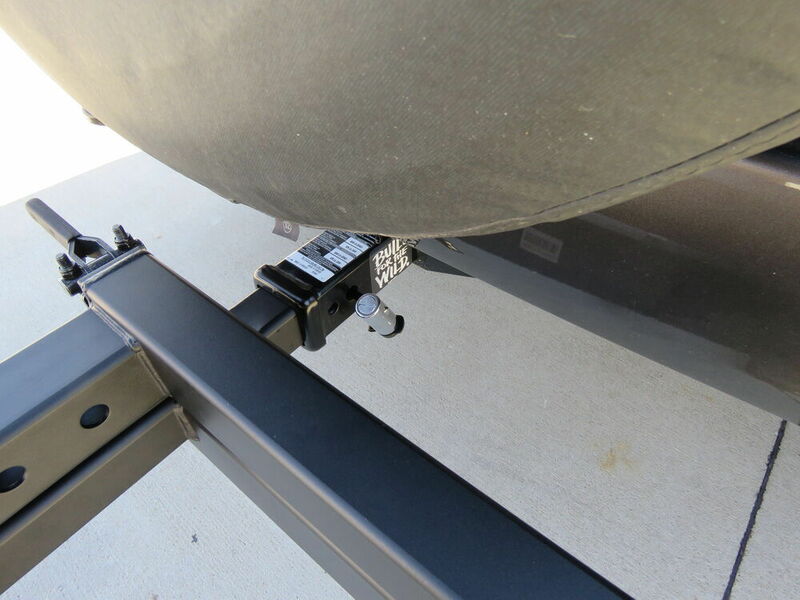 Simply slide the shank into your 2" hitch receiver, insert the threaded hitch pin, and tighten it down with the included hex key. 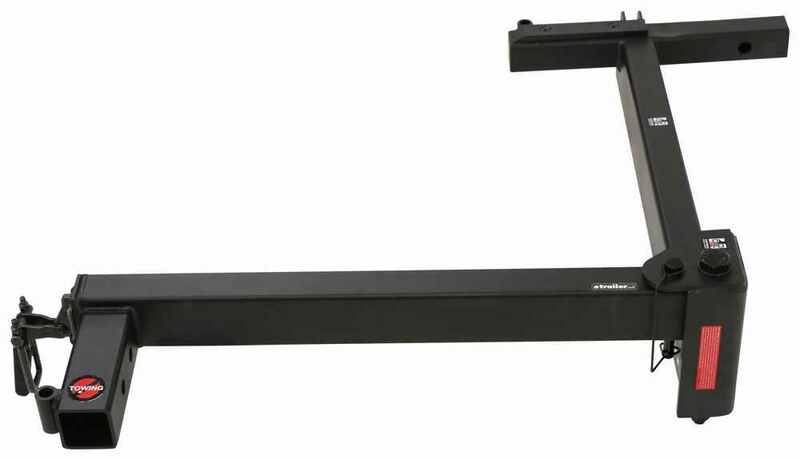 This will also reduce noise and vibration while the extender is installed. 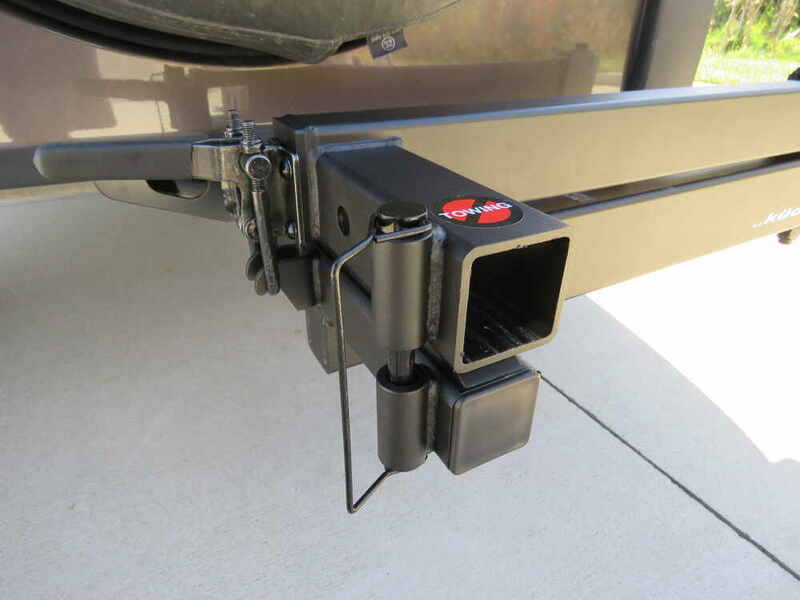 The Pivot comes with a 90-degree, barrel-style lock that fits over the end of the hitch pin to secure the extender to your vehicle. The lock swivels for easy access in tight spaces, and includes a weather-resistant dust cap that keeps the cylinder free from debris. 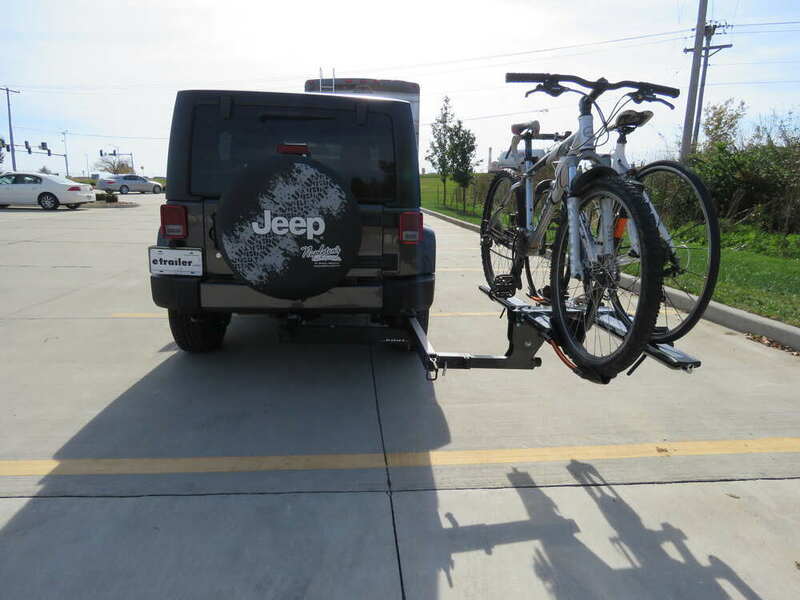 Your bike rack installs on the Pivot the same way it does in your vehicle's 2" hitch. 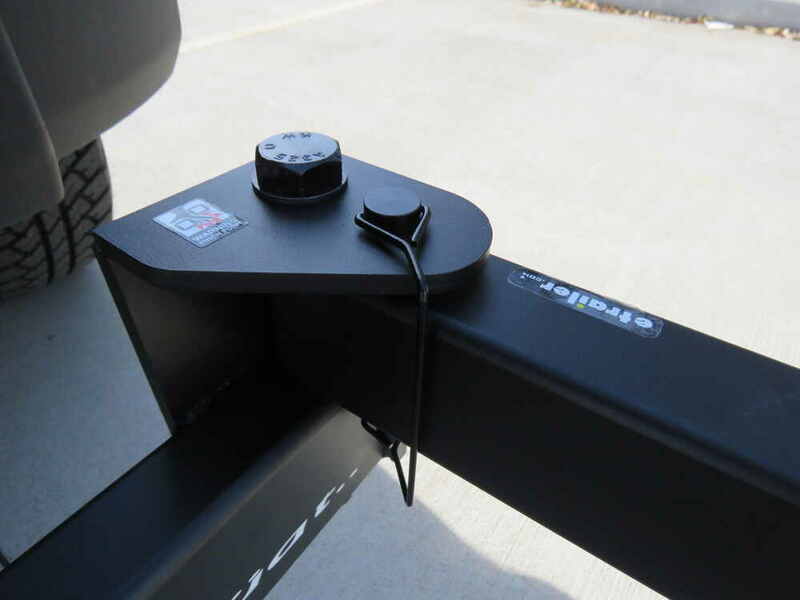 Just slide the bike rack shank into the Pivot's 2" receiver, and secure it with the bike rack's existing hitch pin. 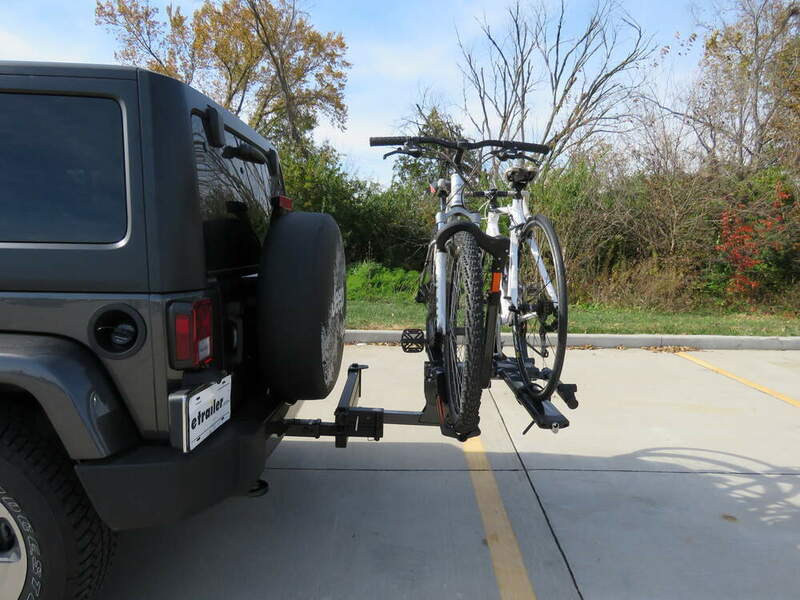 The Pivot has 2 holes for pinning your bike rack - chose which hole to use based on the clearance you need for your vehicle's bumper or rear-mounted spare tire. 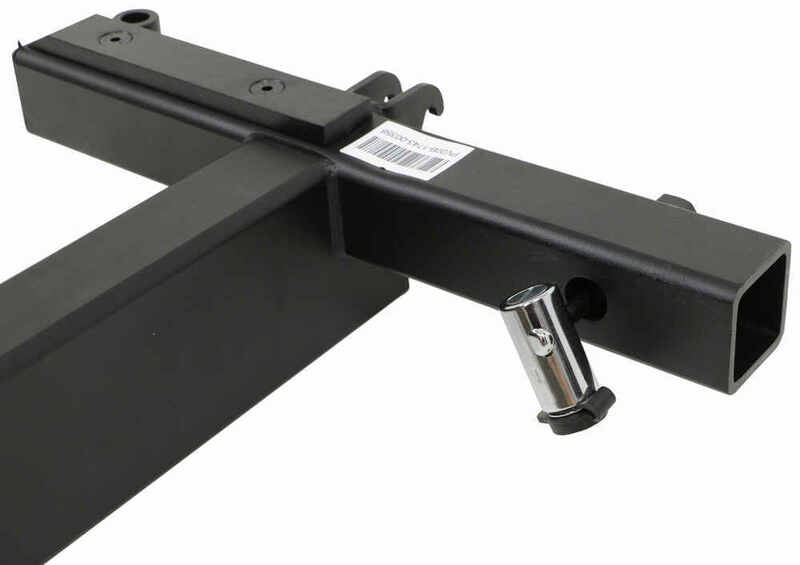 Order: RelevanceNewestRating - High to LowRating - Low to High This hitch extender converts your existing Kuat bike rack into a swing-away rack. 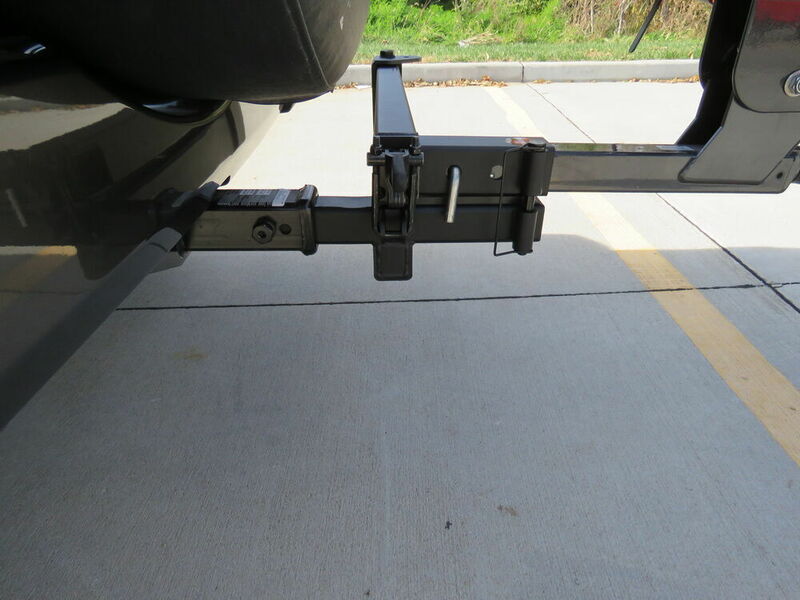 It rotates out 90 degrees to provide quick and easy access to the rear of your vehicle. 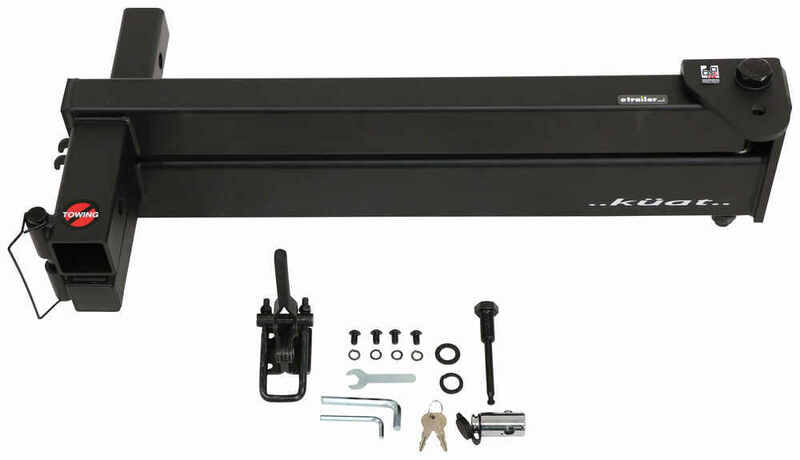 Includes locking, anti-rattle hitch pin. Great! It will brobably wear out eventually, but I am guessing that will happen around the next ice age. 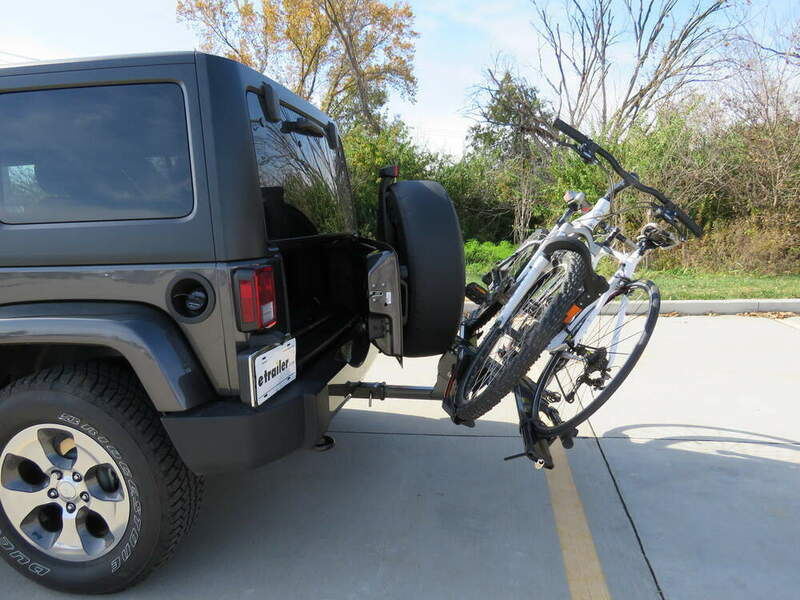 For a 2 bike platform rack that would have enough capacity for your 63 lb bikes we have the Hollywood Racks Sport Rider SE2 part # HR1450Z-E which would work well. 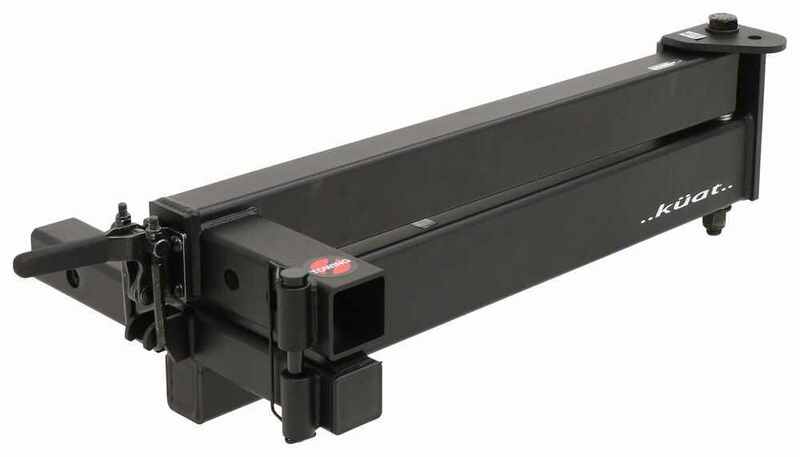 Then to allow it to swing out you'd want the Kuat Pivot part # PV20B which will give you additional clearance to fit past your spare and pivot out when loaded. We have one solution that matches all of the criteria you need. 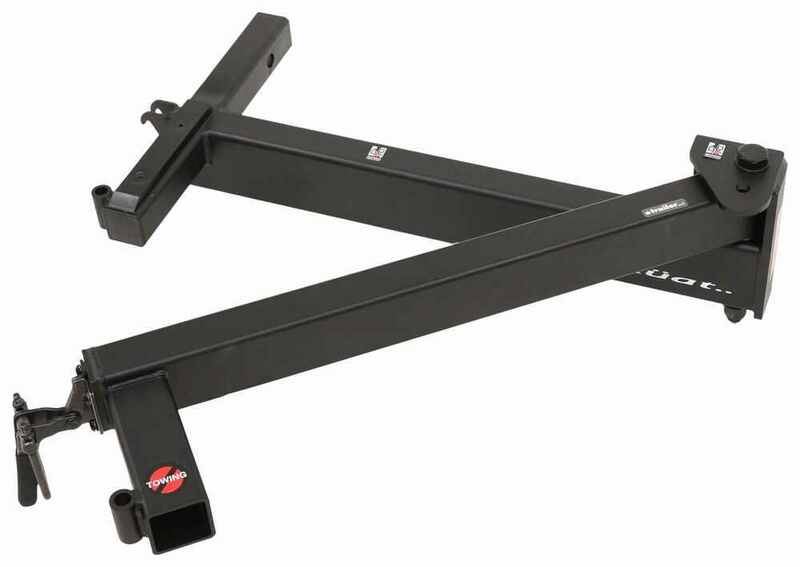 The Kuat NV part # NV22G has the capacity for your heavier bike and is a platform rack that is super easy to load unload. Now to allow it to swing away you'd need to also use the hinge kit part # PV20B which will allow the rack to swing out loaded. This is the only option we have that covers all your bases and it would work really well! 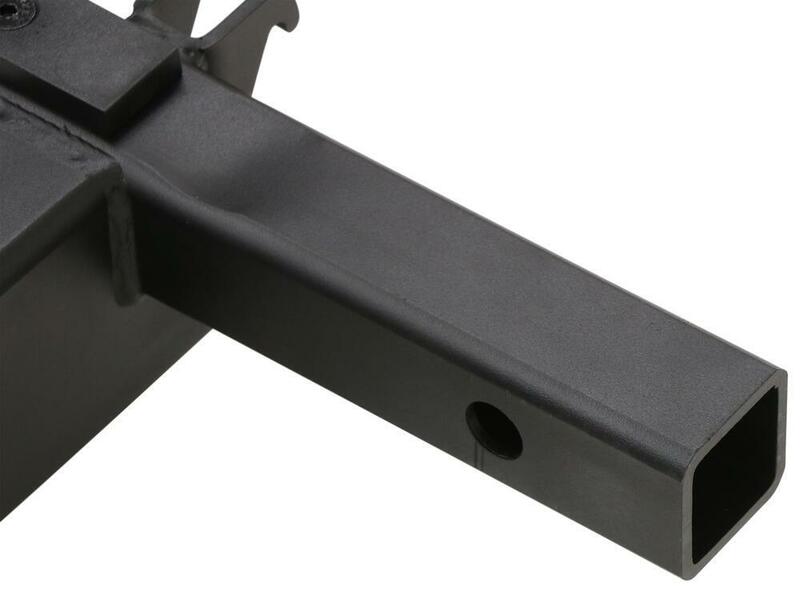 You will need to take a quick measurement to make sure that the Kuat Pivot, part # PV20B will clear your step bumper. 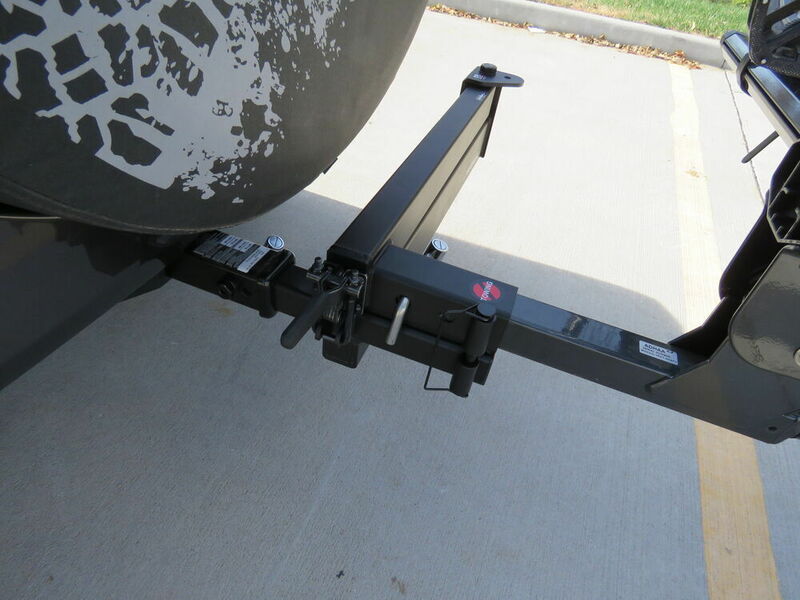 Simply measure from the center of the hitch pin hole to the furthest point of the step bumper away from the hitch. This will give you your required clearance in order to be able to use the Kuat Pivot. 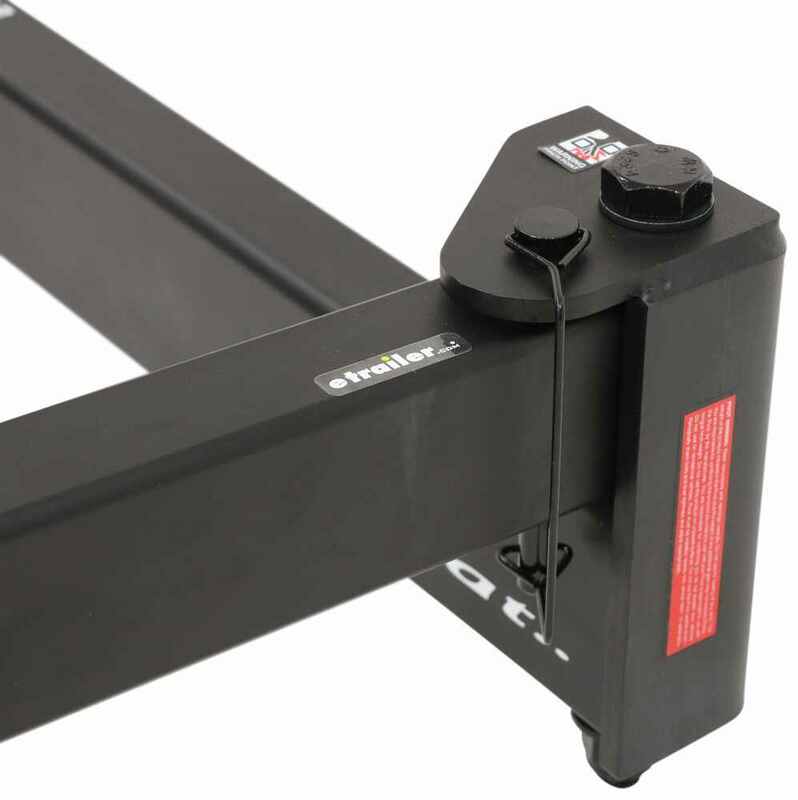 The Kuat Pivot has a minimum clearance of 4-3/4 inches to its nearest part, and your minimum clearance will need to be less than this to be able to use the Kuat Pivot. 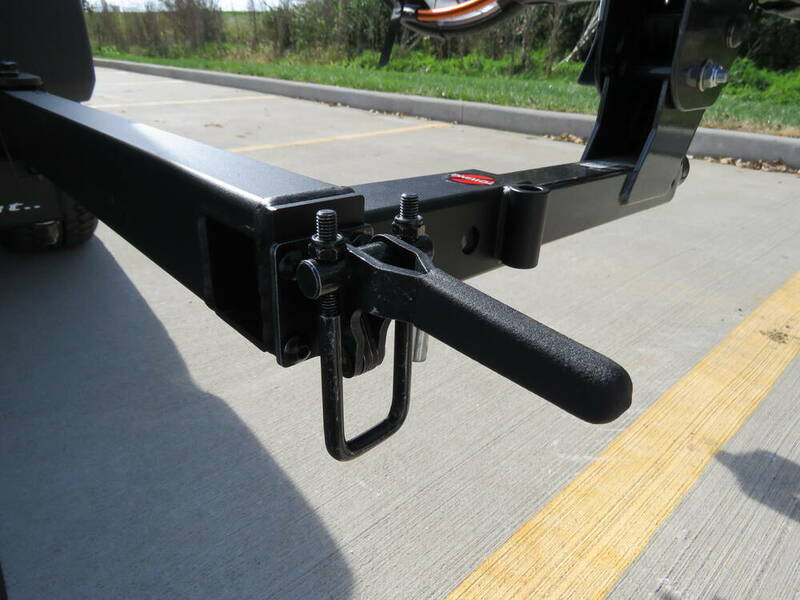 The Kuat Pivot, part # PV20B is usable on the rear of a cargo van like a 2016 Mercedes-Benz Sprinter.